The Visio-guide made an impressive start on Sunday! The use of mobile technology is increasingly popular in the tourism sector, adding to the competitiveness of a tourism attraction. Noyant la Gravoyère wanted to take up the challenge of using GPtO visioguides to enhance its territory and slate mining heritage. The idea of using a digital tool for the cultural tourist attraction “On the Path to the Slate Quarries " is to create an additional link with the visitors: to tell them a story, to guide them, to interact with them through the links "quiz" or “find out more", and especially to enable them to get the most out of their visit to the mines. Available on two of the circuit walks, this multimedia touch screen GPS-type tool will quickly become a vital companion for visitors. It automatically triggers off information and pictures when approaching a point, called a "Station", using geolocation. The visitor is guided entirely by the tool. The variety of information together with the interactive features of this device create a rich, vibrant and fun atmosphere in which to learn, for young and old alike. In addition to the interactive and technological aspect, GPtO is also a great way of creating a made-to-measure story of astounding quality. The team responsible for writing the content, stories, games and riddles worked with specialists in the production of media content. The scenario is then recorded using the voices of professional actors, so that the visitor can relax and listen to the history of the slate mining in Noyant la Gravoyère. Celebrations in Noyant, 24th April! 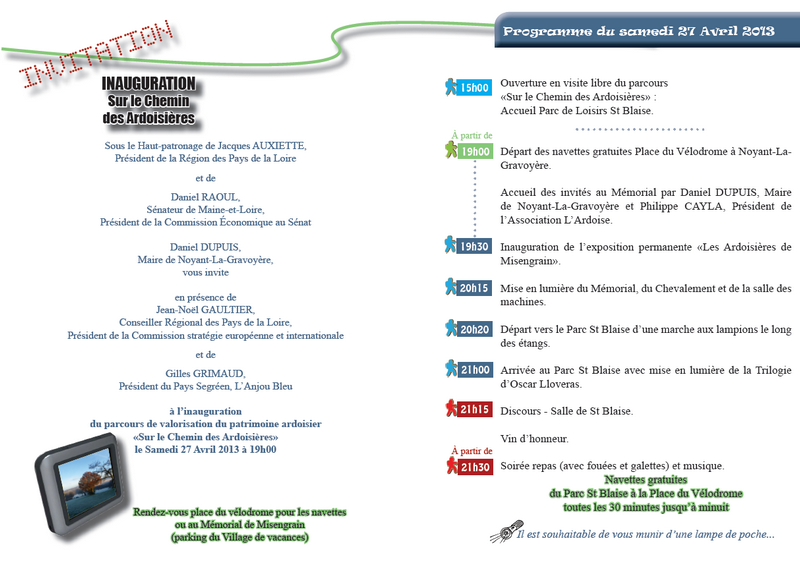 On 27th April, at Noyant la Gravoyère, the interpretive trail "On the Path to the Slate Quarries" will be inaugurated in the presence of ATLANTERRA’s Project Leader (Daniel Dupuis, mayor of Noyant la Gravoyère), Jean-Noël Gaultier, regional councillor for the Loire region and president of the Commission for international and European strategy and Gilles Grimaud, President of Pays Segréen.